With Chicago’s homicide rates for 2016 at their highest since 1996, Donald Trump has called on city officials to “ask for Federal help” if authorities can’t curb the city’s increasing violence. The Chicago Tribune’s homicide count reports 779 homicides in 2016, making it the worst year for homicides since 1996, which saw 796. The Chicago Police Department’s tally of 762 doesn't count police-related shootings, self-defense killings or those which take place on area expressways. With over 700 murders and more than 4,331 shooting victims in 2016, Chicago has the unfortunate claim of having more casualties than Los Angeles and New York combined. With three people dead and 16 wounded in the first six hours of 2017, along with 13 more injured in a spate shootings across the city in 2017 so far, the problem seems likely to persist. Chicago saw 480 murders in 2015, although in terms of murder rates per 100,000, Chicago ranks 24th in the top 25 US cities for 2015, with St Louis, Missouri ranking highest. Trump is correct about murder explosion in Chicago. It’s a national emergency and the city has not solved it for too long. According to the CBS documentary Crisis in Chicago, the shocking statistics tell more of a tale about police resources and practices. According to CBS, stops and arrests tend to increase along with rising crime rates, but in Chicago, there has been a drop. In August 2015, cops stopped and questioned 49,257 people. In August 2016, 8,859 were stopped, a decrease of 80 percent. Arrests also dropped from over 10,000 to 6,900 during the same period. The case of Laquan McDonald, a 17-year-old shot by police officer Jason Van Dyke in 2014, and the so-called ‘Ferguson effect,’ in the aftermath has been suggested as a contributing factor in Chicago’s homicides. While police claimed McDonald ignored their commands to stop before then lunging at officers with a knife, dashcam footage, which had been suppressed but later released, contradicted their claims, instead showing McDonald walking away before a police officer unloaded 17 bullets into him. 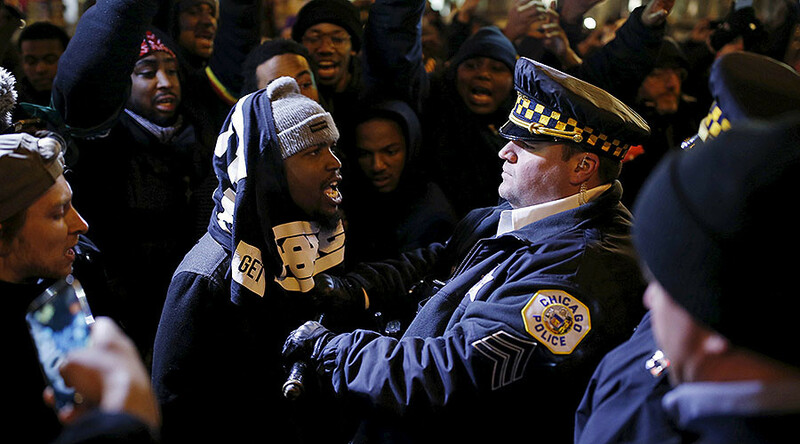 When the damning footage was released, it caused outrage and protests on the streets of Chicago as residents accused the city of a cover-up. Police superintendent Gerry McCarthy was fired following outrage over McDonald’s death and police were subsequently ordered to turn in two-page reports for every stop they carried out, after the ACLU had threatened to sue for racial profiling. “Within six weeks of the shooting scandal, investigative stops fell by nearly 35,000,” CBS says. Superintendent Eddie Johnson blames nationwide “anti-police sentiment” as a result of police shootings of black Americans leading to “emboldened” criminals committing violent crimes, along with lax sentencing for repeat offenders. Johnson noted that a large proportion of violent crimes took place place in five police districts in the South and West side of the city. Harrison and Englewood accounted for a quarter of homicides and shooting incidents. In Chicago’s racially segregated South and West Sides, murder rates are higher than other areas in the city. According to the New York Times, 12 percent of Chicago’s black population live in a census block that is 100 percent black. Loyola University Chicago criminology professor Arthur Lurigio, found many gangs have fractured, also leading to an increase in violence. Johnson pointed to a 10 percent increase in gun arrests and a 20 percent increase in gun recoveries by police in 2016 to deny claims police efforts were to blame. 2017 will, according to Johnson, see an improvement with an increase in surveillance cameras and data-driven command centers in Englewood and Harrison districts, along with the hiring of around 500 new officers.